Pastor Tom has been married to Sandi since 1991. They have three full-of-life children who make each day special. Pastor Tom and his family came to Hosanna in December 2011 as the English Pastor. He brings more than 20 years of ministry experiences working with a diversity of backgrounds and cultures. 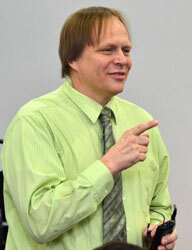 Since 1999, Pastor Tom has ministered in Canada focusing on the development of English Congregations in Chinese churches. He has a passion for mentoring people to grow as a “One of a Kind” follower of Christ who can partner alongside the passions of our English Congregation.